In the Old Town district of Nice in Provence, France, many visitors sit on the outside terraces of street cafes and watch the world go by. The Old Town district of Nice in Provence, France has many street cafes and charming little shops. 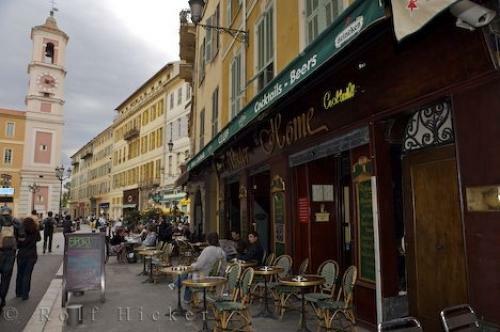 This street cafe is on the Rue de la Prefecture which is the main street of the Old Town of Nice, Provence. A perfect spot to stop for coffee after sightseeing.Street Cafe in Rue de la Prefecture in Old Town, Nice, Provence, Cote d'Azur, France, Europe. Photo of a street cafe on the Rue de la Prefecture in Old Town Nice, Provence in France, Europe.